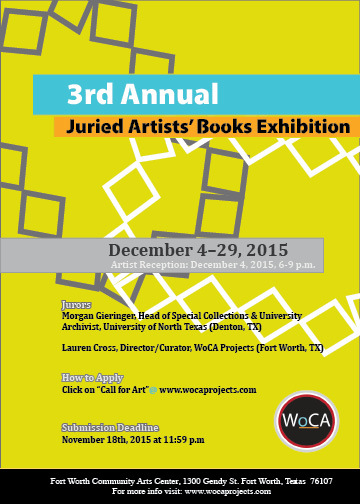 In December 2015, WoCA Projects presents its 3rd Annual Juried Artists’ Books Exhibition at the Fort Worth Community Arts Center (USA). Submission Deadline: Wednesday, November 18th, 2015 at 11:59 p.m.
Artists’ books are not limited to traditional bookbinding forms and conceptual forms are welcome. Exhibition will run December 4-29, 2015. Artist Reception will take place on Friday, December 4th from 6-8:30 p.m.
One artist will receive a $500 Purchase Award. Their selected work will be added to the University of North Texas Willis Library’s Rare Books Collection. 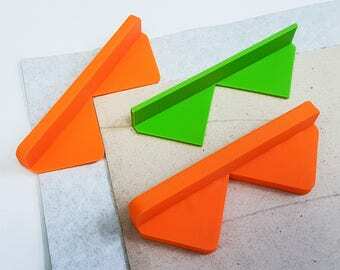 $25 for up to 3 entries. $5 for each additional image. A maximum of 5 images (uploaded through the “Call for Art” tab of the WoCA Projects website) total.